All of the romanization systems commonly seen in Taiwan — bastardized Wade-Giles, MPS2, Tongyong Pinyin, and Hanyu Pinyin — use the same spelling (tones aside) for the unnecessarily ugly but scenically situated Taipei County town of Wulai (Mandarin: Wūlái / 烏來). And the formerly official but little-seen Gwoyeu Romatzyh isn’t so different: Ulai. So getting this one spelled correctly shouldn’t be a big deal. 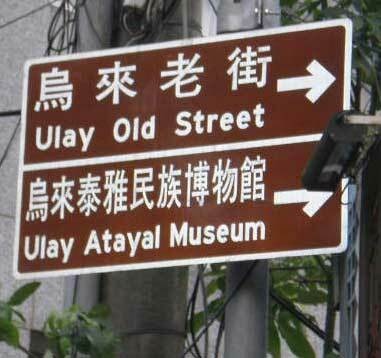 But on a recent trip there I saw the spelling of “Ulay” on relatively recent official signage. So, about the “Ulay” spelling: Could it be the correct spelling in the system used to write the language of the Atayal people indigenous to the area? A search of some Taiwan government Web sites leads to me to believe that, yes, it could be. But I asked several people in Wulai who said they were literate in Atayal script, and they said that “Wulai” was the correct spelling for the town’s name in the Atayal language. Still, these were not linguists or teachers, and this is Taiwan, where chabuduo-ism and outright ignorance of romanization are strong. So when I returned home I went to Wulai’s official website, which only made matters worse. There I found all of the following forms: Wulai, WuLai, Wulia, Wulay, and Ulay. Wulia — in big letters, no less. 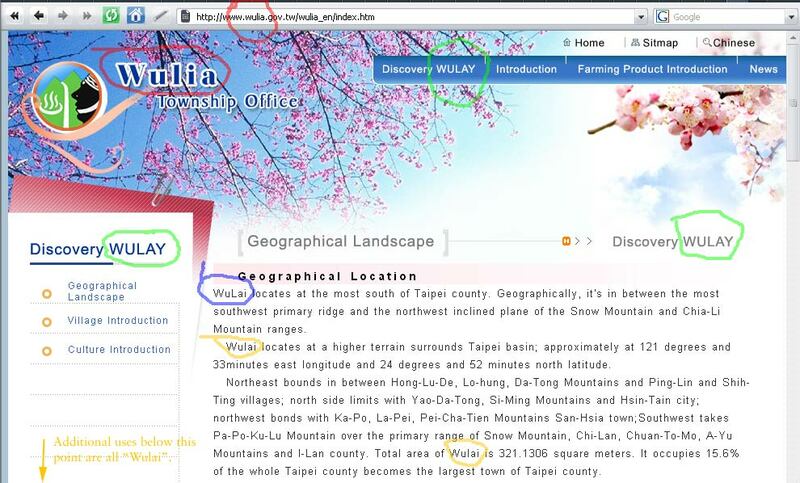 Remarkably, the township uses the URL of www.wulia.gov.tw for its site, though, fortunately, www.wulai.gov.tw also works. I doubt this is anything other than a typo that has somehow not been corrected but has instead gained force. Wulai — This spelling is the one used for at least most of the text. WuLai — Die, intercaps, die! Ulay — found in the Mandarin portion of the site. Elsewhere I also found the form Ulai; but in these cases that spelling almost certainly has nothing to do with Gwoyeu Romatzyh. So, whatever the correct spelling is, that is the government should be using, not this mishmash. And it should let people know how to pronounce it correctly in the original language, not just Mandarin. 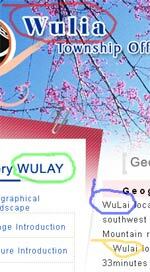 Perhaps it’s too late for this name, though, as “Wulai” is so well known. Regardless of the spelling, though, the name is another example of Chinese characters being used to represent a name that did not originate with a Sinitic language. Thus, the name doesn’t really have anything to do with crows (烏) coming (來). 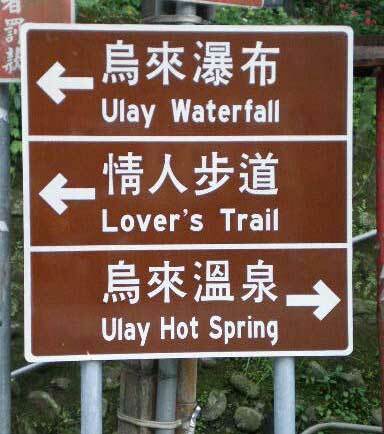 Instead, it refers to the hot springs in the area. This entry was posted in Aborigine languages, aborigines, alphabet, Chinese, Chinese characters, Gwoyeu Romatzyh, languages, Mandarin, romanization, signage, Taiwan, writing systems and tagged taipei county, wulai by Pinyin Info. Bookmark the permalink. I have also seen “Uray” used somewhere. Uray? That looks like some sort of weird L/R pun. ULAI is perfect GR Tonal Spelling (Gwoyeu Romatzyh). Why do you consider perfectly-spelled GR to be wrong? You misunderstand me. I know very well that Ulai is how Wulai (Pinyin) is spelled in Gwoyeu Romatzyh. I did, after all, note that in the very first paragraph of the post. To spell out my point a bit more: I think it was far more likely that the “Ulai” spelling seen in the Mandarin text of a few government websites was only coincidentally GR and that the specific instances I found some ten years ago on government sites of that spelling were based on someone’s ad hoc spelling or even mere sloppiness rather than a conscious effort to render correct GR. I say this based on several observations: (1) even when GR was Taiwan’s official romanization system it was basically never used for place names here; (2) the instances I was referring to came decades after GR was officially shunted aside (more than once, even: by MPS2, Tongyong Pinyin, and Hanyu Pinyin); and (3) Taiwan’s officials have used romanization sloppily a hell of a lot. YMMV.